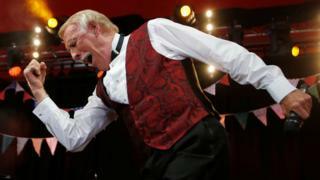 Sir Bruce Forsyth, who has died at the age of 89, hosted some of the biggest shows on British TV of the past 60 years - from Sunday Night at the London Palladium to Strictly Come Dancing. As well as the prime time game shows for which he was best known, there were many other sides to his long career, from movies to a TV sitcom and attempts to crack America. Sir Bruce is the only entertainer whose career spanned the entire TV era. He made his first appearance at the age of 11 on Come and Be Televised in 1939, just three years after regular BBC TV broadcasts began. He performed a song and tap dance routine and was interviewed by the programme's host Jasmine Bligh, who asked what his ambition was. He replied: "I want to become a star and buy my mum a fur coat." Days later, BBC TV was suspended because of the outbreak of war. Bruce turned professional three years later and his first advert in trade paper The Stage read: "Bruce Forsyth: available for anything." But he didn't find stardom until the age of 30, when he was chosen to host Sunday Night at the London Palladium on ITV. Before that, he was a jobbing performer on the variety circuit. "I gave myself five years and I thought, if I don't do any good in five years, I don't want to end up being a frustrated performer [so] I'll get out of the business," he said. "And the five years were nearly up, and I got the job at the Palladium." After finding fame, he made his West End musical debut in 1964 in a show called Little Me, about fictional Hollywood diva Belle Poitrine. The show had come from Broadway, and Bruce played her various male patrons. The Times' drama critic described him as "omni-competent" and concluded that "the honours of the evening go to the multiple performance of Bruce Forsyth as a senile slum landlord, thick-spectacled doughboy, leather-jacketed German film director, and egregiously patrician lover of Miss Poitrine's dreams". Image caption Sir Bruce with Julie Andrews (left) and Beryl Reid in Star! That musical led him to the movies, with a role in Star!, the 1968 biopic of British actress Gertrude Lawrence, played by Julie Andrews. Sir Bruce played her tough vaudevillian father, and the film was nominated for seven Oscars - although none were for Sir Bruce's acting. He later said he wished he had done more acting. "I'd like to have done more of that, but in Britain we tend to pigeonhole people. "In Britain I'm really known as the game show [host]. That's the pigeonhole they've put me in, and that's where I'm stuck." He also appeared in Bedknobs and Broomsticks in 1971. But he missed out on a role that could have really launched his film career - Fagin in the 1968 filmed version of Oliver! Brucie released a string of singles in the 1960s and '70s, although none made it to the charts. Some were novelty songs related to his TV career - like 1959's I'm In Charge, named after his Sunday Night at the London Palladium catchphrase. There were other jolly pop songs, and in 1968 he sung the odd patriotic ditty I'm Backing Britain, the anthem of a campaign to boost the economy by urging workers to work an extra half an hour a day for free. And he appeared on Top of the Pops in 1975 performing Barry Manilow's Sandra, with lyrics that now sound horribly sexist, beginning: "She's a great little housewife/Though sometimes she talks like a fool." He was eager to replicate his British success across the Atlantic. In 1979, he took his one-man show to Broadway, which he described as "a dream come true". But he was angered when the British press seized on the negative reviews and described it as "the most controversial episode of my professional career". Seven years later, he returned to the US with an ABC game show called Bruce Forsyth's Hot Streak. A YouTube clip shows the enthusiastic American crowd greeting him with chants of "Bruce! Bruce! Bruce!" Despite that, and despite him showing his usual warmth and repartee, he didn't quite translate to a US audience and the show didn't last beyond its initial three-month run. He would have tried again to break the States - but his priorities lay with his family. "I'd liked to have made it in America very much indeed, but it wasn't to be and I think I would have gone back there again and kept going on having a go for America," he said. "Because I think with me being the all-round entertainer I could have stood a good chance. "But at that time of making a decision, I met my darling wife Wilnelia and it sort of changed my attitude towards my life in general." Sir Bruce left game shows behind for a while to star in a Thames TV sitcom in 1986 and 87. He played officious, overbearing supermarket manager Cecil Slinger in Slinger's Day - a sequel to Tripper's Day, which ended when its star Leonard Rossiter died in 1984. Sir Bruce's attempt at scripted TV comedy can be found on YouTube. As the new millennium dawned, it seemed that his career was fading. Play Your Cards Right had been axed by ITV - leading Brucie to have a rare fit of public anger, saying the channel's controller David Liddiment had "embarrassed me, humiliated me, and shown me no respect whatsoever". But a few years later, he was watching Have I Got News for You - which uses guest hosts - when Wilnelia turned to him and said: "You could do that show." He replied: "I was just thinking the same thing, darling." So he phoned team captain Paul Merton, who put his name forward to the producers. That appearance, which included a memorable round of Play Your Iraqi Cards Right, reminded the nation of the Brucie magic and directly led to his booking for Strictly Come Dancing, which launched the following year. If it had ever been in doubt, his status as a national treasure was assured.